Concerning aliens, everyone knows the mythical Rosewell story, the kind little E.T created by Spielberg or Tim Burton’s crazy heroes from Mars Attacks. But there is an alien you would never have imagined and this one can land on your wrist: HM6 Alien Nation by MB&F. 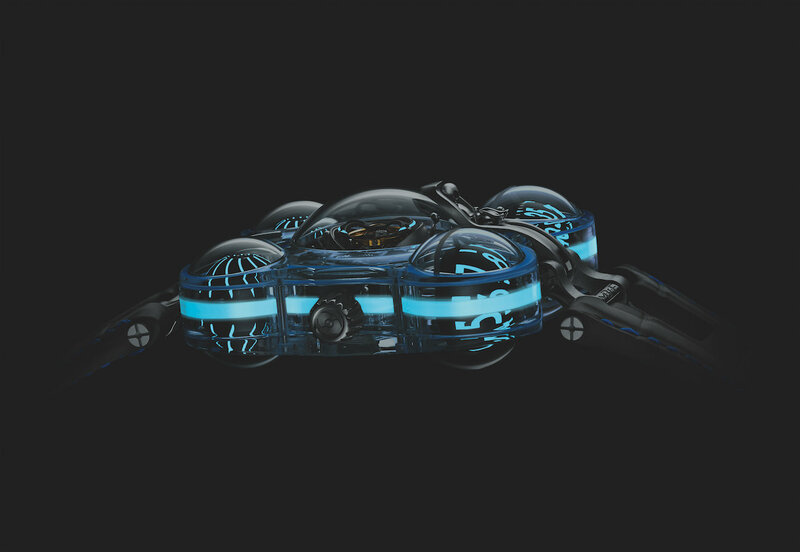 As a true sci-fi lover, Maximilian Büsser wished to create a machine every Star Trek commandants would want. And to achieve that, he associated with renowned engraver Olivier Khun who helped him creating a surreal watch, coming right from another galaxy: HM6 Alien Nation. And these are true alien that land on four lucky wrists. Far from being inactive, HM6 Alien Nation’s aliens are represented by white gold micro-sculptures generating energy that helps the whole vessel to fly. Olivier has engraved and sculpted himself the four aliens on the watch, what represents a meticulous work realised during one full-time month for a single watch. Then HM6 Alien Nation is truly transparent, all made with bomber sapphire glass, which is extremely delicate to manipulate, and consolidated with grade 5 titanium. The glass case represents around 510 hours of work itself. 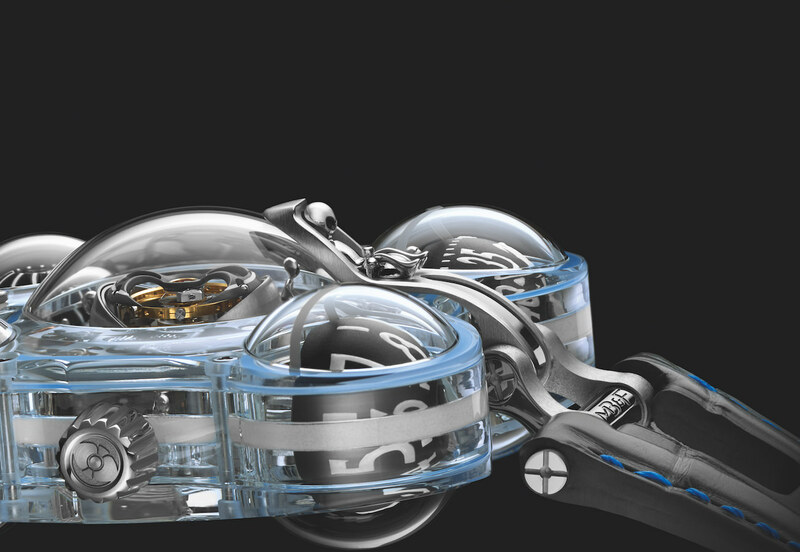 In addition to the four glass arms on HM6 Alien Nation, the most impressive phenomenon remains the engine, the fifth alien from MB&F factories. 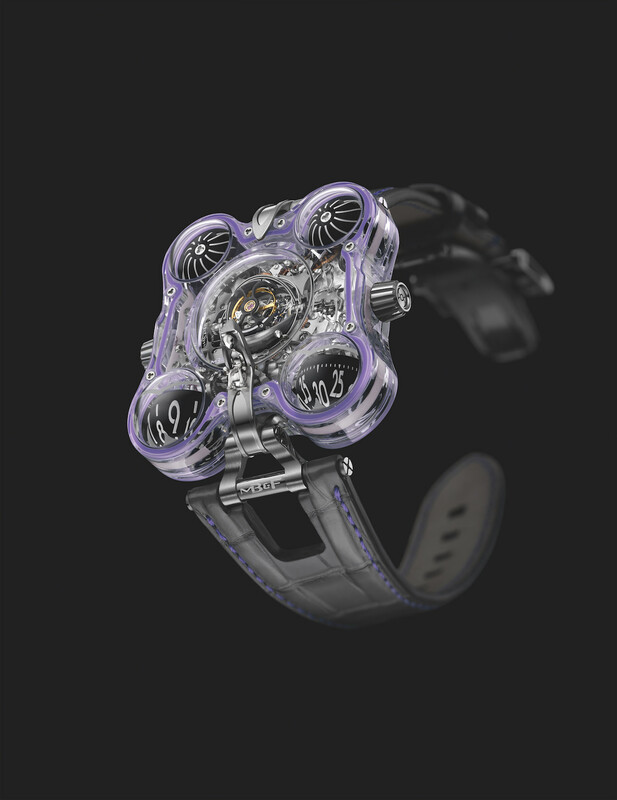 After three years of development, HM6 comes to life, created with 496 components surmounted by 60 seconds flying tourbillon. 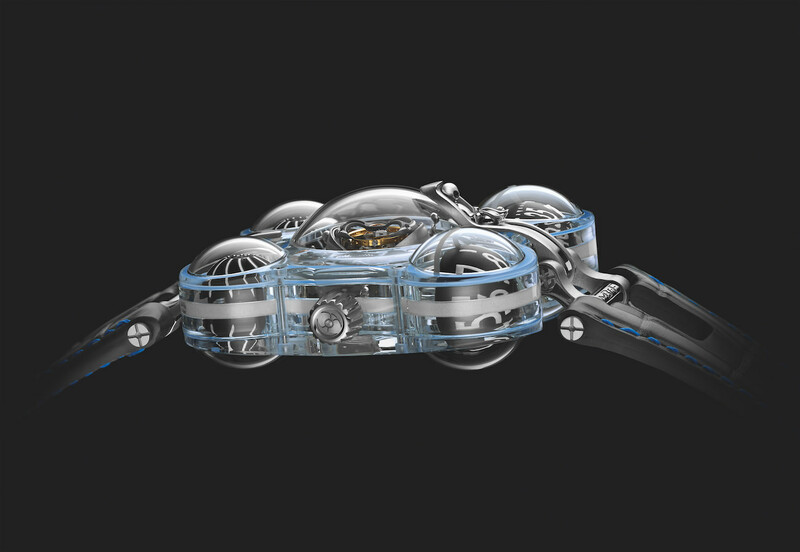 HM6 Alien Nation’s turbines generate an aerodynamic resistance that slows the winding speed and allow the movement to regulate itself in total autonomy. Then, the four HM6 Alien Nation models are truly unique thanks to the use of AGT Ultra bands that shine in the dark and make the four watches truly fantastic. This high-tech material seems almost electric and is adorned by Super-Luminova on the most precious and delicate zones like the MB&F logo or dial indicators. So the four models come to life in a truly singular colour: blue, green, turquoise or violet. 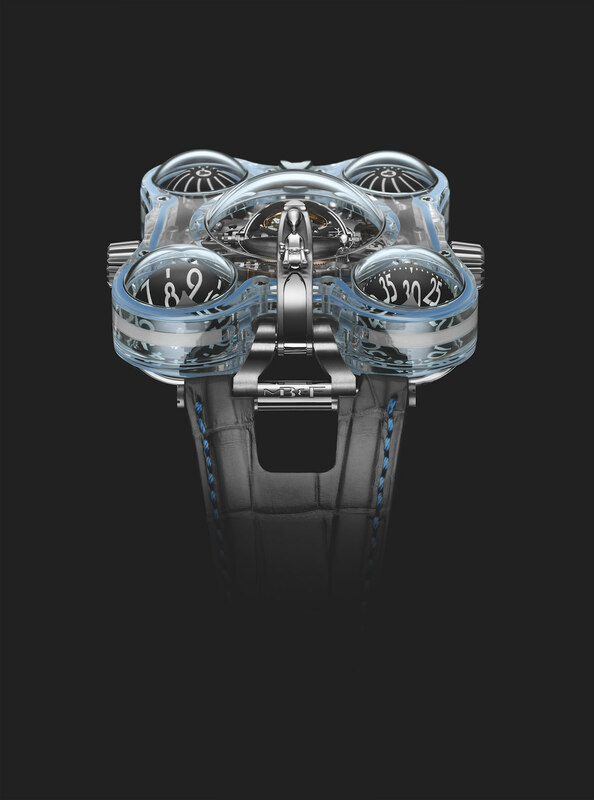 Each watch’s price also seems a little bit surreal because each HM6 Alien Nation costs half a million dollars, but four buyers from somewhere else have already kidnapped them! 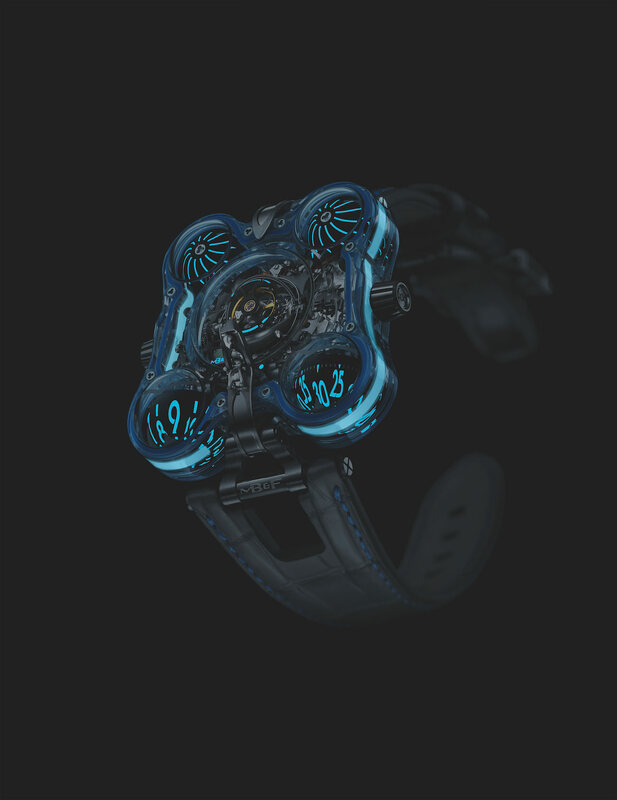 Share the post "HM6 Alien Nation: four unique watches that seem to come from a sci-fi movie"